These courts probably exist – but where? Everywhere I go I see basketball and tennis courts. Soccer and baseball fields also litter the landscape. Even the “scourge” of society – skateboarders – get skate parks filled with ramps and rails to shred up. But what about facilities aimed at street hockey players? Currently street hockey players enlist basketball courts to play, bringing their own nets. However shooting wide will likely result in chasing the ball some ways, as not every basketball court has an encircling fence like tennis courts do. Tennis courts are too small to use for hockey, and usually have permanent nets installed. I keep referring to basketball and tennis courts because they set an established precedent. They are permanent facilities where you just have to show up with your own equipment. Why these hockey courts aren’t more commonplace – especially here in Canada – I haven’t the foggiest idea. There may be more safety concerns compared to basketball and tennis, but having played a lot of street hockey I’ve never seen any incidents. Everyone plays a very composed, restrained game. The only ones who would oppose these hockey courts are the people who truly own and operate Canada – hockey arena operators, or “gatekeepers” as they are more commonly referred to. Ain’t no one playing hockey for free! No way no how. I believe the odd basketball court can be modified to become a hockey court. Even all-new facilities wouldn’t cost much more than a tennis court – we’re just talking pavement and chain-link fence here. If you build it they will come. Also I’m curious: do you have outdoor hockey courts in your area? Are they comparable to the description above? Let me know. There’s one outdoor hockey court on the seawall in vancouver before english bay near sunset beach, but you must bring your own milk basket as nets. That’s what I’m talking about! You see b-ballers bringing their own backboards and nets? Or tennis racketeers bringing their own net? It’s discrimination. Those are non-existent in Vancouver, but growing up in Calgary they were plentiful. If I recall correctly the nets were not fixed, and there was no pavement (with painted lines) for a surface – instead a rubber lining was placed (over grass) for the ice? I’m prescribing a basketball court essentially, but for street hockey fulltime. They exist in all over in California. I went to college in San Luis Obispo (halfway between San Fransisco and Los Angeles) and we had one that was literally on the beach. The nets were not permanent but there was a shed next to the rink that had nets in it and you could sign out a shed key (basically forever till they changed the locks every 3 years) from the city for free. In California of all places! Still I am seeing a common theme – no permanent nets. Are they much more problematic than a permanent basketball hoop or tennis net? A chain link net cemented into the ground would be adequate. Out door box/rink at Renfrew & 17th (Renfrew Park). But, I totally argee. Good to know – that’s close to me, might check it out soon. Thanks! There are a few on places like school playgrounds, but usually without permanent nets (likely due to either the threat of vandalism, wanting the space for rambunctious games of tag, or the legendary Chicago winters). I’ve also seen ones indoors at gyms, but they usually have a soccer goal, not a hockey one. in niagara falls we have a few…. and i built one at Duke on old courts but they had the nerve to tear it down after i graduated! 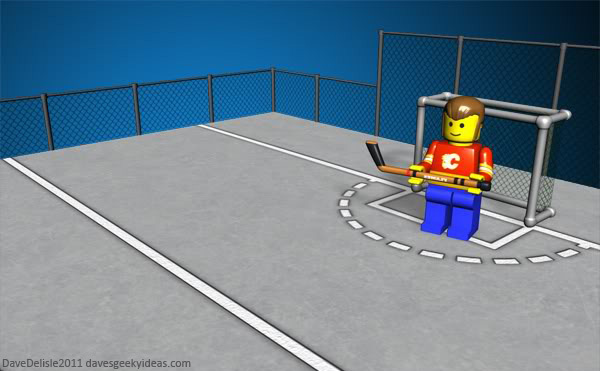 Tearing down anything hockey: sacrilege. Unless it’s Edmonton’s “City Of Champions” sign. I’d be down for that. Very cool thanks! Though I am shocked to see it empty. There should be be dozens of people on the court! Hundreds nearby waiting for their turn to play! At least that’s how I envision such a magical place. I do find it rather telling the hockey court is in much better shape than the adjacent basketball court and baseball diamond. I go to Bainbridge Island quite often, gonna have to check it out! Thanks! At least one outdoor hockey rink stays up in Thunder Bay – Charry Park. Play an annual ball hockey game there in the summer (have to bring 2 goal nets). Most (if not all) of the rest of the outdoor rinks are taken down with many converted to baseball diamonds for the summer. See some tennis courts by some apt. bldgs. that I never see a net on but see hockey goals, so must being used by some for hockey. Here an online pic of Charry Park. As the Aussies say: NOICE! Valley Ridge Park in SeaTac, WA has a hockey court but I’ve only seen folks playing street soccer in it.